Yesterday I did a lip lift. My patient was a young woman, which is unusual for this procedure. Most women that need a lip lift are older, and they have noticed the upper lip getting “thinner” as they age. Since the “red” part of the lip is getting thinner, they assume this is the part that needs to be augmented. So when a woman comes to me for lip enhancement, most of the time she is thinking about lip fillers, whether it be fat, collagen, restylane or one of the many other fillers available nowadays. With lip fillers, the trouble comes when the surgeon “fills out” the lips, and the patient looks like she is pouting, or like she has “duck lips”. Why does this happen? As the face ages, and the skin follows gravity, the upper lip is dragged down and actually elongates. Since the red part of the lip is attached to the gums, the skin of the lip “rolls over” the red part, so the red part appears to “shrink”. Since the lip is already long, when you add more bulk to the red part, it starts to bump into the lower lip and gets “pushed out”. Thus the pouty look or “duck lips”. With a lip lift there is no ‘filling’ — no possibility of duck lips. The lip lift works by taking a strip of skin fom the part of the lip close to the nose and hiding the scar in the line of separation between nose and lip. This scar is very well disguised, similar to the face lift scar in front of the ear, as the surgical incision is between two different anatomic structures. In many cases, the lip lift result is superior to lip fillers because the lip contour does actually look younger, rather than just “fatter”. With the lip lift, the lip has a more natural relation to the lower lip. What about my lip lift patient from yesterday? She had tried alloderm and goretex (both lip fillers) without success. The fillers did not give her the youthful look that she desired. She said when she “pulled her lip up” it looked like she wanted it to look. Thus, she was a perfect candidate for the lip lift procedure. After the lip lift she looked great, and the scar will be very well disguised. The lip lift is a great procedure! Your case sounds a little complex. I think I would be able to give you a lot more guidance if we had a virtual consult because the incision of the Lip Lift may some times interfere with vascularity to the nose. In addition, doing a lip lift in conjunction with a nose job revision is not necessarily a good idea because you need a stable base for the lip lift revision and if you are doing a nasal revision that may interfere with your stable base, depending on what te nasal procedure is. In any case, I will have Kelly at kelly@cosmeticsurg.net contact your for pricing info. I would like to know what’s the cost of a lip lift (revision) and a Nose job (revision)? I don’t how much longer it will take but I know it does get better with time. In order to make an educated judgement I will have to look at you, either pictures or a Skype or FaceTime. Let Kelly at kelly@cosmeticsurg.net if you are interested. It looks like in your case dentures may help, although you may need further measures like a lip lift. It also looks like you may need a chin implant. But your case has many variables (dentures, small chin, long lip, etc) so I think a virtual consult where I get to see you on Skype or FaceTime and look at pictures so I can give you very specific recommendations. I wear dentures. I’ve always had a long upper lip and my natural teeth were always short. (Heredity) Also, a receded chin. Together makes me look like those “apple lady” dolls. I’m on my 2nd pair of dentures, (which she lengthened), but she’s insisting my bite is normal. However, I feel like I have too much lip bunching together when I bite down, pushing my lips out. If I “gape” my mouth there’s just this dark hole, no teeth, even with nicely made dentures. If I smile, it looks like I’m snarling. I’m wondering if given that I have dentures. should my approach be different? How would I find a dentist to “understand” the look I’m trying to achieve as well? If I pull my lip up with my fingers, I can achieve the perfect ratio. But I’m not sure if wearing dentures may be an asset or hinderance. Thank you for your time. I follow you from RealSelf and have seen your beautiful work! If you would like to we can set up a virtual consult so I can evaluate your lip in more detail. You could also contact Kelly at kelly@cosmeticsurg.net for more info. It might be that although your lip is almost “normal” 1.1 cm your upper jaw and teeth are shorter than average. In that case you might benefit from a combination of a 3mm lip lift and then adding veneers to your teeth. In any case, let’s set up a virtual consult and I can give you more specifics. And yes, I would recommend a lip lift, because we can make your asymmetry better. hi thanks for your video. I just have a question my upper lip space is 1.2 cm..from the base of my nose to the v of my lip. When I relax my jaw, as you suggested to see tooth show…i can’t see my teeth. Also both sides of my lips are different… meaning one side is higher than the other…and when i talk one side raises much higher than the other…a but snarly..
what would you recommend in a situation like this? I will have Kelly contact you ASAP.We’re located in Baltimore. Most of our patients come from out of town and stay overnight. I’m very interested in lip lift surgery. Pleaee send me more information. It is possible you have a long maxilla (upper jaw bone). In such cases one has to play a balancing act between shortening lip and showing too much tooth. Frankly, I’d have to see your photos and have you measure your upper lip to give you a better idea of what could/could not be done. Sometimes, ironically, a lip filler works well in these cases because an increase in the red part of your lip balances out the skin of the upper lip and makes it appear more proportional. If you are interested in a virtual consult contact Kelly at kelly@cosmeticsurg.net. I don’t care about my teeth showing of not… I just think I look deformed especially when my mouth is closed. But I don’t want to look like a rabbit if I get a lip lift. My teeth already show… Is it still possible to do a lip lift without it making too much teeth show? My upper lip is just so long and I have a small turned up nose, while that’s considered cute, it only makes the philtrum look even longer. Try Skype of FaceTime so I can see your lips in motion and form a better judgement. thank you for getting back to me. I will contact kelly and schedule a virtual consult. I’m pretty sure I already answered one of your previous posts. If I have not, please let us know and I will answer your post. In any case, contact Kelly at kelly@cosmeticsurg.net, as I think to answer your question meaningfully I will need pictures. I am an 40 years old asian male. I am interested in doing a bullhorn lift to reduce the upper lip. However, because the tubercle of my lip is a little pointy and bulky, I am afraid that this will pull it up more and make it more prominent and draw too much attention to that area. Would I be a good candidate to do a bull horn lift and a small lip reduction in to reduce that tubercle area? Or would doing a bull horn and a corner lip lift to be a better alternative? My reasoning is a corner lip lift would expose more of the lateral pink part of the lip. I have addressed most of the issues on the previous answer. As for the corner lip lift, I would have to see how much it drops now and estimate hou much lift I get out of the bullhorn. Again, this level of precision in an answer needs pictures, conversation, etc., which are better handled in a virtual consult. Sorry about the delay in answering. I was in a medical mission trip to Armenia and just came back. As pertains to your upper lip, it is long, and could be shortened. As for the tubercle, I would have to see pictures to see what you mean. In general, I would not excise mucosa of the lip unless I absolutely had to, because there can be tightness, or if you take too much then it becomes complicated. I would do the lip lift first, then see how things settle out. Most of the time after 4 months the whole appearance of the lips changes and things that were an issue before are not as prominent. My upper lip is about 21mm with a somewhat prominent tubercle. I would like to shorten it. Because of the tubercle, would an upper lip lift cause the tubercle to be more noticeable? Or would I have to do a upper lift reduction too to reduce the pink part of the tubercle? I’m a 40 male of asian decent. I have done several lip lifts in african americans and not found it to be a problem. There are several possible reasons. One, the face is usually not a problem, think of how many african americans have had facelifts and nose jobs. Secondly, if you eliminate tension from a scar there is usually no problems with excess scarring. Our technique for lip lift uses deep stitches attached to cartilage in order to decrease tension on the scar. Contact Kelly at kelly@cosmeticsurg.net she could help you. I am a dark skin African. I already have full lips and I think a lip lift would make my overall face look stunning. How could I prevent keloid scarring from a lip lift? Yes, the procedure would help if you have a long upper lip. If you are interested, Kelly at kelly@cosmeticsurg.net could set up a Skype consult for us so I could see your lip and evaluate you before you make a decision. Hi. Ive been interested in this procedure along with doing a lot of research on it. I wanted to know if you perform lip lifts on someone as young as 20 years of age. I want more tooth show as I am very uncomfortable with the way my mouth looks when relaxed or closed. I always feel like I look sad or mad. Thank you. Hope to hear from you soon. No I don’t know. It is not a common procedure. We do get patients from all over, and just this last week we had people from Canada, Florida, Chicago, and New York. Read this blogpost about the technical details of the procedure. The reason some surgeons have problems with the scar is that when you tie the lip skin to the nose skin, all the tension is at that suture line and a lot of collagen gets deposited to bear the tension load. I tie the underside of the skin to the membrane of the bone or cartilage, therefore, the skin of the lip and nose junction bears no load. Thus, the scar is minimal, and after a few weeks it is invisible. Call my patient coordinator, Kelly, at our office 410 494-8100. She has had the procedure done. She can answer many of your questions as a patient herself. We’d love to help you, we do a lot of patients from out of town. Thank you for your interest in Dr. Rodriguez’ lip lift procedure: https://www.cosmeticsurg.net/blog/2006/10/24/the-lip-lift-more-youthful-lips-without-the-use-of-fillers/ The usual cost for the lip lift performed with local anesthesia is $2,850. For your virtual consultation you will need to e-mail your photos and some basic information. During your virtual consultation Dr. Rodriguez will view your photos and discuss your goals and and give his professional opinion as to your treatment options. Your virtual consultation with Dr. Rodriguez may be done by Ichat, Skype (our Skype address is cosmeticsurg.net) or telephone, please let me know your preference. 4. (6) A close up of your mouth and nose area, and any specific area that concerns you. E-mail your photos along with your information to preconsult@cosmeticsurg.net there is a one time consultation fee of $75, please note that this fee is applied towards surgery. Once we receive the above information, we will contact you with a date and time for you to call Dr. Rodriguez at 410-494-8100. When you’re ready to schedule your surgery date, our office requires a non-refundable deposit. All fees are due in full two (2) weeks before your surgery date. The lip lift is done with local anesthesia and pre-op testing is not required. Once you are on Dr. Rodriguez’ surgery schedule we will send you information to prepare for you procedure along with prescriptions for you to fill and bring in the day of your procedure. If you’re traveling alone, Dr. Rodriguez recommends that you stay in town one night after surgery. If someone will be coming with you, you may go directly home after the procedure. There are no sutures to remove after the lip lift. We can follow up by telephone and email photos. If you fly into Baltimore, the recommended airport is Baltimore Washington International, which is just 17.3 miles (about 34 minutes) from our office. Keep in mind that Dr. Rodriguez’ schedule fills up fast, so please call 410-494-8100 or email your information as soon as possible! …but it should be the opposite way, the former is 17 mm and the latter is 15 mm. Your post is very comprehensive, but i would need to see a picture to answer your question well. You also need very detailed answers. If you want a well thought out and meaningful response I recommend you contact Kelly at kelly@cosmeticsurg.net to set up a virtual consult. Thank you for your post, and I know this is very important to you, I want to give it the attention it deserves, and I think that needs to be in a virtual consult, preferrably by Skype or iChat where I can actually see your lips. Dear Dr. Ricardo L Rodriguez. I live in Europe and I have hardly heard about the lip lift procedure. I would perhaps be interested to travel to the US to undergo the procedure. I would like to find out the answer to my question before I contact a plastic surgeon or send in my photo. Pardon my poor english. I have a long distance between my nose and the red part of my upper lip, is it called the philtrum? I’m not really sure how to measure. Should it be measured from the actual base of the nose or should it be measured from the tip of the nose? The tip of my nose is a little droopy, so if I measure from that point the distance is 1-2 mm shorter. Also, should I measure down to the “droop” in the cupid bow or to the highest part of the cupid bow? Anyhow the distance is about 15 mm measured from the base of my nose respectively 17 mm measured from the lowest part of the tip of my nose (“measured in the air”), in both causes measured down to the lowest part of the cupids bow. The highest part of the cupids bow is about 3-4 mm higher than the lowest part. I hope you understand this, It’s a little hard to explain it correctly. I’m a 29 year old woman and I understand that this is quite a long distance for a woman? “The problem” is that I have full lips, I’m pleased with how they look. It’s just that the distance between the nose and the red part of the lip is to long. I actually don’t want fuller/bigger/higher lips (I know that the procedure doesn’t make the lip fuller just “higher”). If I do the lip lift procedure, my upper lip will appear higher and then my lower lip will be to small compared to the upper lip. Then I have to augment the lower lip and that will result in way to big lips. Also, I have a little bit of a gummy smile and when mouth is relaxed my upper teeth shows enough. If I lift my lip with my fingers I think that I get a bit of a “rabbit look” and it aint pretty. Will a lip lift make a gummy smile worse? Is there a possibility to file down the teeth a little bit to reduce the “rabbit appearance” after a lip lip? Meaning, if I lift my lip 2 mm then I reduce my teeth 2 mm etc. Because of the risk of the “rabbit look”, the risk of the gummy smile and the risk of getting a to big/high upper lip I would only like to lift my lip maybe 1-2 mm, do you think it’s worth it due to the scar? I’m also considering rhinoplasty, do you think that it’s better for me to “lower the nose” (is that even possible? ), to reduce the distance, instead of a lip lift? My nose look fine in front wiev, it’s actually not to short or anything, it’s just my upper lip that is to long. The only problem I have with my nose is that I think it’s overprojected in profile wiev. If I do a rhinoplasty to correct that and doesn’t undergo a lip lift, will that make the distance between nose and red part of the upper lip appear even longer? Also, I’ve heard that a lip lift can affect the appearance of the nose and nostrils, distort the base of the nose and result in more nostril show. Do you agree with that? In regard to that, isn’t it better to do the rhinoplasty after the lip lift if you have to correct the nose distortion? Finally I’ve heard that botox injection in the upper lip (over the red portion of the lip) can lift the lip a little bit. Do you think that this is a good procedure if you jut want to lift the lip just 1-2 mm? Thank you so much for taking you time to read this long mail! I have done a number of patients from all over the US as well as quite a few Germans living in the US. There aren’t that many surgeons who do the procedure reliably. If you hear about someone, let me know!! you tell me him contact. Unfortunately, there is no alternative. I tried a suture technique once where the suture was looped inside the skin, but patients did not like it as they felt it restricted their lip motion too much. The scar is very hard to see, as a matter of fact, practically invisible if you suture the skin to the deeper tissues rather than just doing a skin to skin repair. My Patient Coordinator, Kelly, had it, and I have a hard time seeing the scar. We have patients you can call so you can hear or see for yourself. I’m a female who’s interested in having the upper lip shortened. it’s about 2cm long. I’m a little nervous about being cut because of scarring and all and I was wondering if something like thermage or ulthera could be used in place of cutting to achieve a shorter philtrum. I think I originally posted this in this wrong place. 20 mm is long, but that is an arbitrary measure. Some people are not bothered by it at all. Some people are very bothered by it. Bottom line, if it bothers you, take care of it because the repair can be done effectively and looks great. It truly is one of those procedures that is a home run most of the time. For a female I shorten it to 11mm, but for a male I usually go for 1.5mm. It’s up to individual taste. Call Kelly at 410 494-8100, she’d love to hear from you! lift. It has always seemed long to me. the very top of the red portion of lip is about 20mm. I was wondering if this is long for a male or average. Because of the placement of the scar underneath the nose, and the techniques I use (rapidly absorbable sutures and fibrin glue) the scar is barely visible when I see the patients at the first week postoperative visit. I have had patients come to see me a month after surgery where I don’t even remember they had the surgery and they have to remind me and literally lift up the nose and point to the nose scar. Most people comment that if they knew it was this easy they would have done it years ago. I will answer you in english but if you decide get a virtual consultation with us, I will personally answer all your questions in spanish. As for the price of different surgeries, you can contact Kelly at kely@cosmeticsurg.net. It is possible to do chin implant and Lip lift at the same time, and indeed I have done it. As for adding a rhinoplasty to it, that is a little different. It depends on what kind of work you want done in the nose. If the nose work is too extensive, it may not be possible to do all three t the same time. Many of our patients do travel from out of town, and it would be ideal if you had the surgery one day and left the next after I checked you out personally. Once you have surgery, I tend to follow up with my patients for as long as necessary, whether that may be a minimum of 4 months or years. Nos encantaria poder verte y ayudarte. Que pases buen dia! QUIERO HACERME LIP LIFT, AFINAR LA NARIZ Y CHIN AUGMENTATION; ES POSIBLE HACER LOS TRES EN UNA SOLA CIRUJIA?. VIVO EN NEW YORK, ES POSIBLE REGRESAR POR CARRETERA A NEW YORK EL MISMO DIA O AL SIGUIENTE DIA DESPUES DE LA CIRUJIA, Y REGRESAR EN LA SIGUIENTE SEMANA PARA LA CONSULTA FINAL?. PODRIA TENER UNA IDEA DEL PRECIO DE ESTE PROCEDIMIENTO? I would wait at least 3 months after surgery, when all the tissues are soft and pliable again. BTW, I’d do the rhinoplasty first, because it will affect how the lip looks. Hey long before or after can a rhinoplasty be done? I would be hesitant to do a rhinoplasty at the same time as a lip lift because of issues related to blood supply needed for healing. It may be able to be done, but I will let others take the risk. I am not willing to take that risk. When properly done. the lip lift incision bears no tension, because the tension is distributed to the deeper tissues. Thus the scar becomes unnoticeable very quickly. I have seen patients a week after surgery that do not look like anything has been done until they lift their head to show me the scar. As for any judgements regarding your particular case, I would have to see pictures. Talk to Kelly at kelly@cosmeticsurg.net if you wannt me to review your pictures. I have heard that you can’t get a lip lift at the same time as rhinoplasty, is it true? And if so, why? Also, I was wondering how long it takes for the lip lift to become unnoticeable and the swelling/scarring to die down? Also, in my case my upper lip is almost none existant with there being a small cupids bow but when my face is relaxed you cannot see the sides of the upper lip, will the lip lift help this? Thanks. We have since spoken, and whenever you get the chance, let us know what the neurologist said, for the education of all the readers. Sometimes situations that seem simple have many ramifications that are not obvious unless you get a complete history. The series of pictures you sent me were worth their weight in gold, and as a matter of fact, every person you consult with should get a copy of them. I hope our telephone consult helped! 2) i have a neurological problem !!! He also told me there is NO MORE juvederm in the lip or above the lip !! All of what he said to me DOES NOT MAKE ANY SENSE TO ME!!! 3) see a neuro doc to rule out nerve damage and then he might consider shooting sth in me to dissolve juvederm …. i would like a phone consult w you and I have plenty of pics to show you …how do i arrange this? The doctor probably hit a small artery called the labial artery that runs along the border of the lips. Anybody who does injections to the lips will eventually hit it. What you had was a blood clot that turned into fibrous tissue. I had juvederm injection only in my upper left lip because i wanted symmetry …after the injection i was in extreme pain, a ball formed above my lip and i was black and blue for about 4 weeks time. I had had juvederm injected in that lip before but never did i have this reaction before until this last time. Same doctor by the way. I went to see him one week after that last injection and he said it would resolve and that i should massage it. One year later my lip still does not move “up” when i smile so now I look deformed when i smile. Can you help? The American Society of Plastic Surgeons is located in Chicago. Just ask around, I’m sure there’s plenty of good people there. We do a lot of people from out of town, so you are always welcome. Anyone as good as you here in Chicago? You sound like a perfect candidate for an upper lip lift. I think a vast number of women getting lip injections would be better served by lip lifts. Thanks for checking out our blog, let your friends know about it. I had a filler in my upper lip about six years ago.At first I was very happy with it. T,he problem now is I have a duck lip. From the front it does not look too bad just some drooping on the bottom of the upper lip. I am 58 years old and I have become very self conscious about this, to the point that I try to avoid someone looking at my profile when possiblle. I have been researching for over a year for possible corrective procedures when I found your site. Is there any possibility that there is something that can be done to help me. Unfortunately,I don’t know anyone in Pittsburgh that performs the procedure. Although the procedure is talked about a lot on the internet, not a lot of people go through with it. Those that do, are very happy. I do only the bullhorn, because the scar is hidden under the nose. The seagull scar is on the white line of the lip, where the skin of the lip rolls into the red part of the lip. It is right there on the kisser. No way to hide it. Call Kelly, our patient coordinator, she had the procedure done. She can talk to you as a fellow patient can. I love the procedure and I’d love to see you. 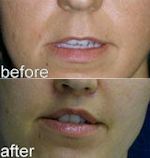 I am very interested in an upper lip lift, but cannot seem to find anyone in the Pittsburgh, PA area. How many upper lip lift procedures have you performed? Is there any difference between the ‘seagull’ and the ‘bullhorn’ cut? I might be travelling to Baltimore…! The corners of the lip can be raised by a procedure called Depressor Anguli Oris (DAO) release. A small incision is made in the corner of the mouth (on the inside, or mucosal side), and the muscle is released. I like to do a Botox trial before, because patients can lose the ability to turn the corners of the mouth down after the procedure. I usually do the botox at the time of the upper lip lift. If the patient likes the result, she can then go on to getting the DAO release. You lip lifts look good. I was wondering if you ever add a corner lip lift to your regular lip lift so the corners don’t look droopy. Here is a doctor’s site I found that describes it and has a photo. You have a good reputation on the blogs and are close enough to Raleigh, NC where I live. Haven’t found anyone here who does lip lifts. We would need to see a picture and have you send some measurements to see how the procedure would be of benefit to you. But yes, I love doing it. I am interested in a lip lift. I am 32 years old. Can you tell me what the price is for this procedure?